Our National Parks are turning 100, and they're starting to look a little grey. Fifty-four is not just the age of President Obama, it's also the average age of a visitor to Yellowstone National Park. America's parks and public lands belong to all of us, but we're not all enjoying them. As we look to the next 100 years of conservation in America, it's critical that we make sure everyone has opportunities to get outdoors. That's why this Earth Day I am pledging to help get Every Kid in a Park - and I am asking you to join me. Every Kid in a Park is President Obama's campaign to encourage fourth graders and their families to experience their parks and public lands. It's an effort to ensure that our lands, waters and shores continue to be enjoyed for the next 100 years. Kids can download passes to visit our federal lands for free for an entire year. The campaign is also raising money to supplement transportation costs, one of the biggest barriers to participation in the outdoors, for kids and schools. Sierra Club also took the pledge. During the month of April, Sierra Club staff and volunteers are leading over 100 outings to encourage kids (and adults) to explore, enjoy and protect the outdoors. The outings, while celebrating the Centennial of the National Park Service, are taking place in neighborhood parks, national parks and everything in between. The Outdoors Alliance for Kids (OAK) took the pledge, too. OAK recently announced a spring lineup of Every Kid in a Park events being run by alliance members, collectively reaching nearly 5,000 fourth graders with a park experience over the next few months. Commitments made by Sierra Club, OAK and many of our partners were included in the White House announcement to get nearly half a million kids outdoors as part of this week's Every Kid in a Park day of action. To honor the pledge, many partners came together yesterday to connect 200 fourth graders from Baltimore to Fort McHenry National Monument and Historic Shrine. I was there to celebrate National Park Week and the Every Kid in a Park day of action. The kids were there to have fun - and they did. 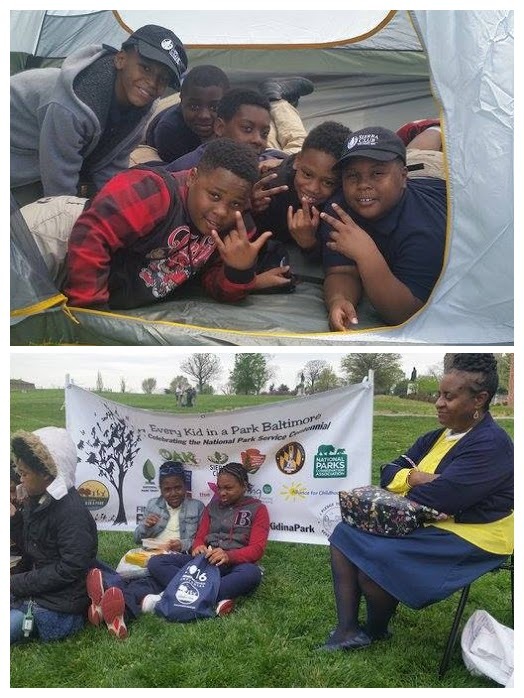 After getting their Every Kid in a Park passes, the fourth graders learned about the Monument and participated in a series of nature-based activities. 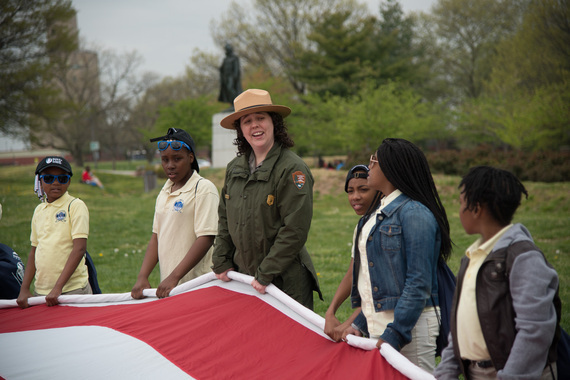 The defense of Fort McHenry was the inspiration for Francis Scott Key to write the Star-Spangled Banner and the kids got to fold a massive replica of the flag with National Park Service rangers. They also learned about oysters in the harbor from Living Classrooms and pitched a tent by the river with the National Park Trust. Sierra Club's Baltimore Inspiring Connections Outdoors youth from Digital Harbor High School was there to lead several activity stations for the fourth graders, including face painting. White House Council on Environmental Quality Managing Director Christy Goldfuss joins Sierra Club's Baltimore Inspiring Connections Outdoors/Digital Harbor High School seniors. This Earth Day, join me in supporting this important initiative to connect every fourth grader with nature. I just took the pledge to help get Every Kid in a Park and I hope you will, too.